Combine sugar and water in a saucepan and place on medium-high heat. Swirl pan several times until sugar is dissolved. Wipe down the sides of the pan with a wet pastry brush to remove sugar crystals. Cook for about 10 minutes just til you see the mixture start to turn color. As soon as the butter is melted, add the nuts and remove from the heat. Pour over a silpat or baking paper and spread it out. Set aside to cool. Can be made ahead of time but be careful, you'll eat it before you make the ice cream. 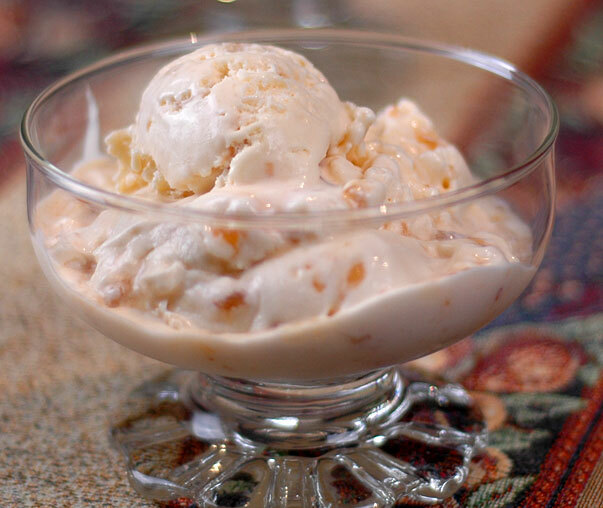 Once the ice cream is ready to come out of the machine, pour it into a bowl and stir the macadamia toffee crunch through the ice cream. Place in a container and freeze until firm.